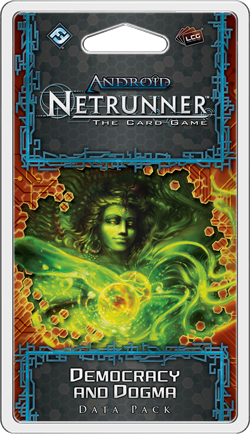 Fantasy Flight Games is proud to announce the upcoming release of Democracy and Dogma, the third Data Pack in the Mumbad Cycle for Android: Netrunner! In Democracy and Dogma, everyone has an interest in the Indian Union's heated national elections. Accordingly, there's more than a little room for snooping, blackmail, coercion, and other seedy political dealings. 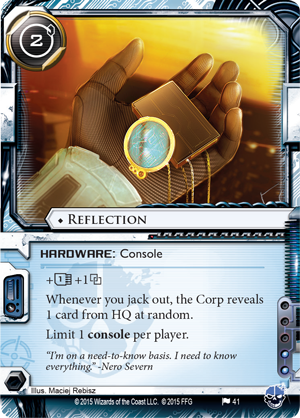 At the heart of it all is the information broker and new Criminal Runner, Nero Severn (Democracy and Dogma, 40), who arrives with his new console, consumer-grade hardware, and network of informants. 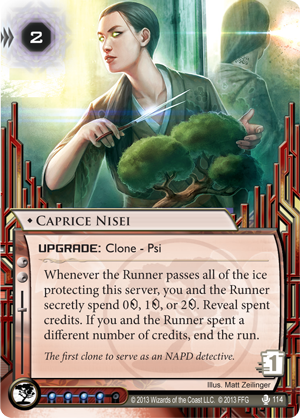 Meanwhile, Jinteki struggles to reshape the dialogue surrounding the issue of clone rights, and Haas-Bioroid launches a clone suffrage movement and voting machine initiative to take advantage of their rival's moment of weakness. 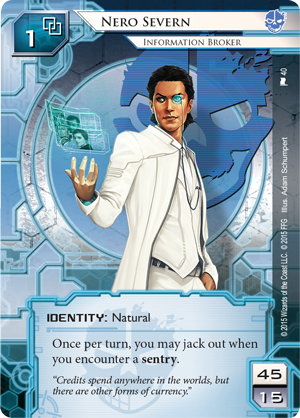 Nero Severn finds himself in a unique position to exercise his skills for gathering and monetizing everyone's dirty secrets, and there's no shortage of targets. 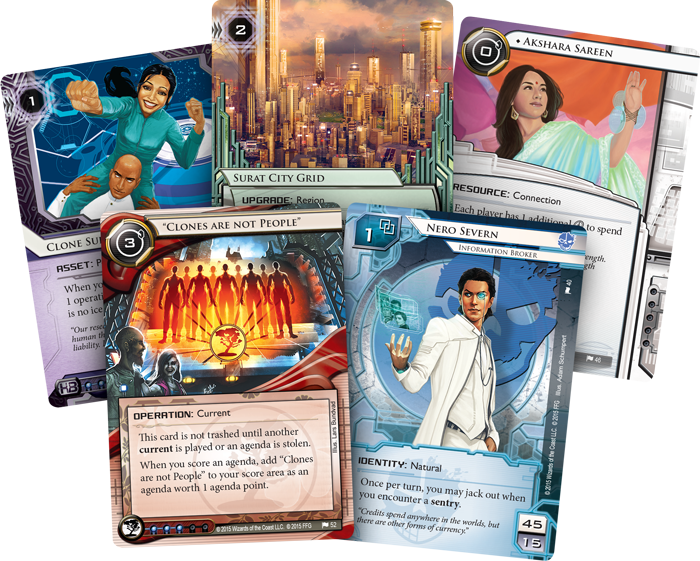 In the heart of Mumbad's political sector, clone rights advocate Akshara Sareen (Democracy and Dogma, 46), local councilmen, Jinteki's PR division, and other players are all hard at work, vying for the population's hearts, minds, and votes. 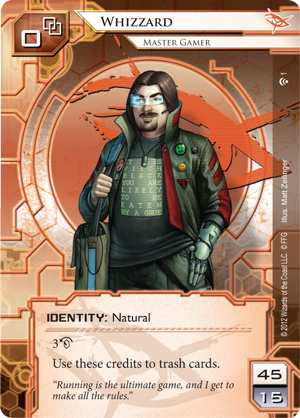 Several of the cards in Democracy and Dogma reinforce the idea that everything has its price, playing directly into the strengths of info merchant Nero Severn. First, you have your malleable Councilman (Democracy and Dogma, 47). Should he ever misstep – and everyone has a dirty secret somewhere – you can shuffle him into your designs, then call upon him to exert his influence when the Corp rezzes an asset you'd rather not see rezzed. 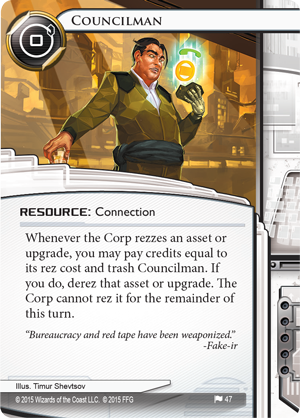 If you pay credits equal to the rez cost of that asset and get rid of the dirt you've collected on the Councilman (read: trashing him), the Councilman will immediately derez that asset and prevent it from being rezzed until the end of the turn. 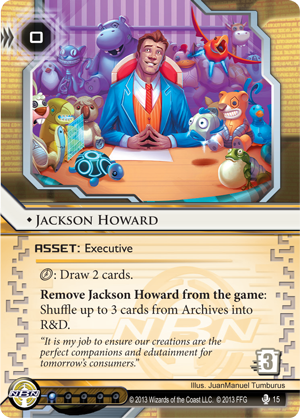 Played well, your Councilman can stop the Corp from using Jackson Howard (Opening Moves, 15) to prevent you from accessing agendas in Archives by shuffling them into R&D. 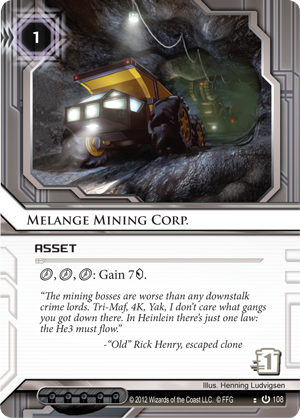 It can delay the benefits of a contract with the Melange Mining Corp (Core Set, 108) or a group of Capital Investors (The Valley, 18). Moreover, if you then run on the server, you might be able to trash the asset normally, meaning that if you get the Corp low on funds you may be able to keep it low on funds. 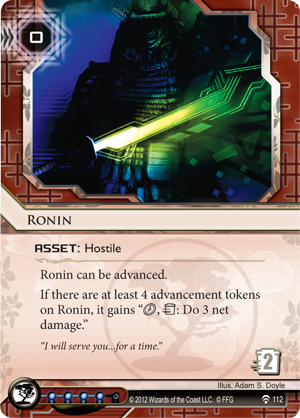 Keeping a Councilman in your back pocket might even save your life if you can call on him to stop a Ronin (Future Proof, 112) or some other hostile asset. 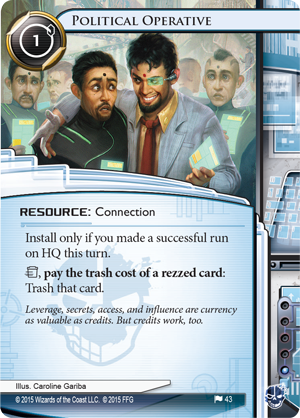 Next, Democracy and Dogma introduces Political Operative (Democracy and Dogma, 43), a connection that allows to trash any card the Corp rezzes by paying its trash cost. 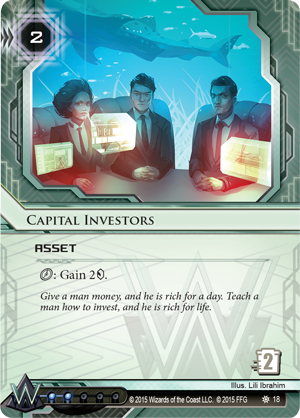 It won't allow you to trash ice, since they don't have trash costs, but it does force the Corp to think carefully about whether or not it wants to invest credits in rezzing any of its other cards – no matter whether they're assets or upgrades. It's true that you have to make a successful run on HQ before you can insinuate yourself with your Political Operative, but runs on HQ are nothing new for Criminals, nor are they too concerning to Whizzard (What Lies Ahead, 1), who can use his recurring credits in combination with Political Operative. Then, once it's installed, Political Operative provides you much of the same utility that you'd gain from a Councilman, and takes it another step forward, allowing you to do things like trash Caprice Nisei (Double Time, 114) when the Corp rezzes her during a run on her server or prevent the brain damage that Ryon Knight (Chrome City, 54) might otherwise deal you. 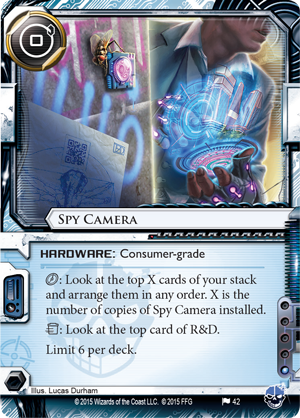 With resources such as these readily available to those who can exploit them, it's no wonder that you'll find Nero Severn making good use of his Reflection (Democracy and Dogma, 41) to brave runs on HQ and his series of covertly installed Spy Cameras (Democracy and Dogma, 42) to ensure that his information arrives exactly as he expects. 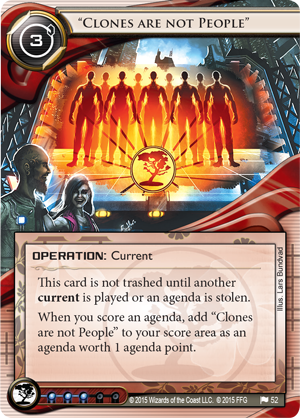 Ultimately, it would be foolish to think a Corporation as large and powerful as Jinteki would ever lie down and accept defeat, and in Democracy and Dogma, you'll find them fighting back with a new political asset, seedy political dealings, and a new current, "Clones Are Not People" (Democracy and Dogma, 52). The result? You'll find the game's cyberstruggles elevated to a point of incredible tension… as well as incredible potential reward. After all, there's nothing less at stake than the hearts and minds of the world's most populous democracy. 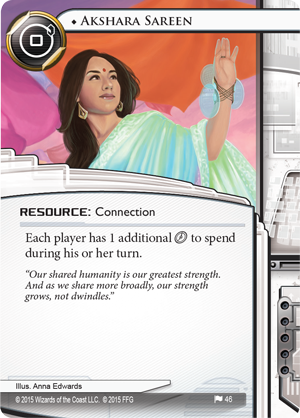 Look for Democracy and Dogma to immerse you more fully in the Indian Union's heated politics and cyberstruggles when the Data Pack arrives at retailers in the fourth quarter of 2015!